Some were friends and colleagues; others were intellectual adversaries of one of the most noteworthy and frequently cited legal philosophers of the past century. 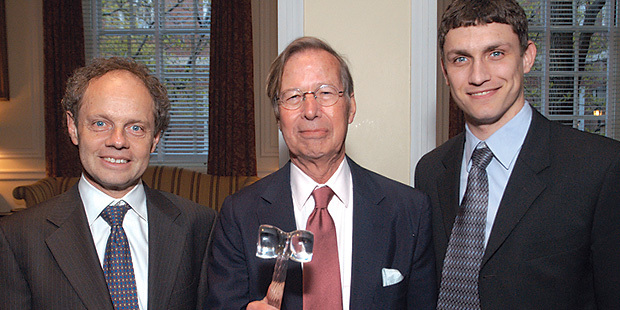 All came together to honor Ronald Dworkin when the 63rd volume of the Annual Survey of American Law was dedicated to him on April 17. With this award for his exceptional role in the study and practice of law in the United States, Dworkin, the Frank Henry Sommer Professor of Law, joins the ranks of honorees such as Supreme Court Justice Antonin Scalia (2005), Judge Richard Posner of the U.S. Court of Appeals for the Seventh Circuit (2004), Attorney General Janet Reno (1998) and Supreme Court Justice Thurgood Marshall (1983). During the dedication ceremony, hosted by Annual Survey editor-in-chief Malachi Boyuls ’06, Dworkin’s colleagues—University Professor Thomas Nagel; Judge Posner; Professor Lawrence Sager, who has since become dean of the University of Texas School of Law; Professor Thomas Scanlon of Harvard University; Lord Hoffmann of the House of Lords; Robert B. Silvers, coeditor of the New York Review of Books; and then-Columbia, now-NYU University Professor Jeremy Waldron—reminisced about “Ronnie’s” long and illustrious career. The portrait that emerged was of a man as intellectually relentless as he is charming. “He is a person single-handedly swimming against the tide to keep up and raise the standards of our collective political life,” commented Scanlon. There has been pain, but also gain. “I believe that everything that I have written bears the improving mark of those rigorous sessions, and if there is an ounce of egalitarian good sense in my book on property and my subsequent writings, it is Ronald Dworkin’s responsibility,” says Dworkin’s former student Waldron, a frequent colloquium visitor, who will coteach the series this year, his first as an NYU professor. Hoffmann was equally appreciative of Dworkin’s contributions. He described how Law’s Empire (Harvard University Press, 1986), Dworkin’s masterwork on the judgment of particularly difficult cases, “offered the best explanation for what I was trying to do.” Dworkin’s latest book, Justice in Robes, breaks new ground and deals with the balance between judges’ personal morality and their legal reasoning.